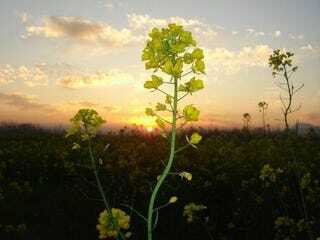 Genetically-modified canola has been breeding undetected in the American wilds for at least "several generations," say scientists. The escaped GM canola has already mutated into a never-before-seen strain, and now it may be modifying other plants too. Sagers and her team found two varieties of transgenic canola in the wild - one modified to be resistant to Monsanto's Roundup herbicide (glyphosate), and one resistant to Bayer Crop Science's Liberty herbicide (gluphosinate). They also found some plants that were resistant to both herbicides, showing that the different GM plants had bred to produce a plant with a new trait that did not exist anywhere else. So why does this matter? Because if the transgenic canola starts swapping genetic material with weed populations - something that is not unlikely - it could spread herbicide resistance to weeds. And that would leave farmers with no way to fight plant pests - and potentially massive crop failures as a result. Photo by Birdy, via Amateur Photography/Nature Images.